So the Bird scooters are now on flatbed trucks, lead by a band of police, headed off into the sunset. They were taken off the Grove streets as of 1 pm today. Police Commander Jorge Colina told me that the scooters are currently not allowed under city law and that a new ordinance needs to be passed so that they are allowed in the future. The scooters apparently were not sanctioned by the City of Miami and police were concerned about their safety. I know that one day when the scooters started appearing a couple of weeks ago, the police came by and were puzzled by them. They didn't know anything about them. They questioned the BID office, but they didn't have a clue about them either. 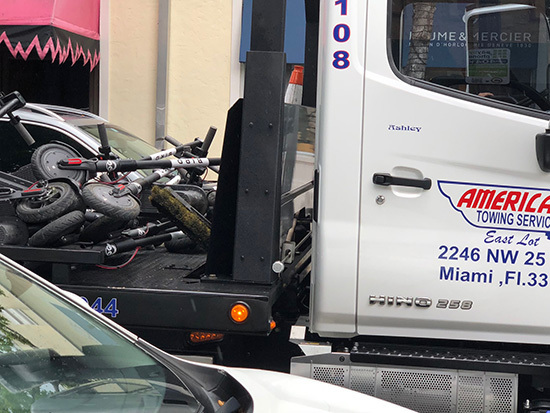 Al Crespo wrote about this a couple of weeks ago, "While these companies have failed to get permission to invade Miami's streets with their scooters, LimeBike did go out and hire Michael Llorente, the former Chief of Staff to then City Commissioner Francis Suarez, and partner with the Mayor's perennial campaign manager Jesse Manzano, as their lobbyist. The City of Miami Police asked that the scooters be removed from the streets last week. Lime Bike complied, Bird scooters did not and so they were picked up by police today, via a towing company with flatbed trucks and the police accompanied them to wherever they hold scooters hostage these days. Crespo says: "These electric scooters are illegal, as per Florida Statute 316.003(77), and contrary to whoever told you that the company 'work(s) closely with the city,' has misled you." I don't remember saying that they worked closely with the city. But as of now we can see they are not part of our landscape, which is a shame. The Grove is being reshaped - new, young office workers can be seen here more and more each day. These office workers loved the scooters as far as I could see. I know in San Francisco the biggest complaint was people leaving them just anywhere when they were finished using them. People would be so upset they would end up throwing them in the bay! That didn't happen here, as far as I could see most people enjoyed them. Our village is sort of made for them. Natalia Vanegas, Public Affairs Manager at Commissioner Ken Russell's office says, "The scooters are not legal to ride on the streets or the sidewalks unless the city has an ordinance permitting it, which it does not yet. Several scooter sharing companies were sent cease and desist letters by the City last week indicating that they would need to remove the scooters, as they are illegal to ride. The Commissioner is a big supporter of last mile options and transit solutions. And I believe the city will be working on some policy resolutions so this type of transportation becomes legal." I loved them. The Grove has been so gloomy these past few years with all the construction, parking issues and street closures. I thought the scooters added so much energy and life to the village. Some at City Hall is not getting their cut. Throwing them in the bay is bad for the environment since the batteries will leak in to thw water and will make the sea creatures very drunk. Scooters are a good form of transportation and unique, however they should not be an excuse for the county and city to abandon their legal mandate to expand publicly funded transportation in face of rediculaous tsunami of development. That's funny. I sorta called it a few weeks ago when I asked if they would be booted. Guess this goes a step further. Looks like the curmudgeons have won this battle. Why am I not surprised? Miami may be the most backassward city in the country. It allows unfettered construction and near zero parking and blocks attempts to alleviate the problems. So much stupid. Wow once cool thing finally happens in the Grove and city management figures out a way to screw it up. Hey, a bunch of us old hippie era folks would love to be able to take a scooter down to the grove and avoid the parking hassles. What a great idea. We should think of the Grove as a destination to have fun, not a commuter corridor for the Coral Gables/Pinecrest commuters. If development brings more people, let it bring more like-minded Grovites who enjoy living and riding close to the earth. Peace and Love. What really is the issue? Leaving them on the sidewalk angers people so much that they have to be removed? and i see the IT IS ILLEGAL argument above but wonder how many ILLEGAL things go on in the grove without enforcement ie private booting companies/towing company vultures ect. is it ILLEGAL to collect monies from grove businesses and in turn commingle into god knows what? all at the expense of the business owner. If I owned a business in the grove I would never pay that BS fee and in turn place that cash into a trust that ONLY goes to grove business interests, new public transportation ideas to increase traffic to the grove, increase of the tree canopy, better waterfront access, ect. “I don't remember saying that they worked closely with the city.” From your post The Bird is the Word on 6/4/2018 you clearly stated they work closely with the city - “They are part of the BirdApp program here in the Grove. If you consider yourself “The Daily news of Coconut Grove” facts do matter!! The solution is simple... since by Florida State Statute, scooters are illegal, the City did the right thing removing them from the street. The companies were operating without business licenses, permits or insurance so by allowing them to operate, the City was taking on all liability. As a citizen of Miami, I would not have liked my tax dollars paying for the consequences of an accident or worse yet, death. Let the City do its work... the state offers an opportunity in its statute for local municipalities to create its own ordinances to regulate the companies and indemnify itself. Fort those of us who like the scooters, let's applaud the City for doing the short-term right AND ensure they follow up with a comprehensive ordinance that allows the scooter companies to operate, meeting all code requirements. Disruption technologies will continue to come and we all get glossy eyed about them... but, let's look at a more basic circumstance. I know we all like restaurants, but I don't think any of would be happy if one day a restaurant opened without any permits, licenses or inspections. Government is there for a reason... let's hold them accountable to do the right thing. The State of Florida has not made the scooters illegal. It is up to each county and municipal government to legislate their use. And they should allow them. With a top speed of 10mph, they are safer than bicycles. I bring my scooterinto the office and tuck it under my desk. Florida Statute 316.003(77) simply defines "STATE ROAD" as "Any highway designated as a state-maintained road by the Department of Transportation". In other words, that statute says absolutely nothing about the legality of these scooters. crespo..I don't know why people lionize this worthless old fart..example #1 why felons shouldn't vote or have any say. Can't wait til he kicks the bucket.